These pieces are written as homage to the piano in its expressive and colorful form. 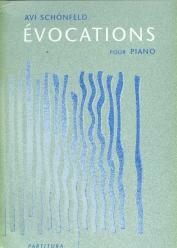 "Evocations" are written for pianists who are in love with their instrument. They are composed with enormous pleasure which the exploration of the natural colors of the piano, its unlimitted poetic possibilities can still give. "Evocations" are modern in style. Their modernity however, doesn´t forbid the melodic inventions which are for me the points of departure, the catalysts for any further compository processes. The first Evocation is a music of light and shadow in which silences and long vibrating chords have a very important meaning. The silences and long vibrating chords have a very important meaning. The right timing and a imaginative use of the pedals are here the key to good interpretation. The middle part of the first "Evocation" is improvisatory and dream-like in character and should be played in a surrealistic almost hallucinatory manner. It glides as if on time, on reality and if the beginning section of this "Evocation" should be played in a deep, ample and sometimes dramatic colors, the middle part of it is transparant, icy and ethereal. Music of silence, dream, loneliness- of frozen, snowy landscapes. Evocation II may be coneived as a sad, solemn and noble procession ending twice with a chord, which contains in it the germs of the following section and makes it almost unavoiable. In both cases this "fatefull" chords bring about a dark threatening movement-the first of which more regular and somehow melodic (page 8), the second (page 12, 13) darker harmonically, more dry and merciless, lossing progressively its regularity, its frame and ending in total desolation and inertia. The middle "bell-like" section of Evocation II employs an unusual combination of colors and registers. It is rather suspension of the musical process than its development. It should give the feeling of waiting, of being at the "gates" of time. Those bells certainly "lost their faith" like those in René Char´s poem. Evocation III is an enigma and I´d like to let it stay like that. The only thing I can say is that the first theme is very supple and elastic and should be like a soft material from which the pianist moulds himself the music, giving it a form like a sculptor. This theme´s suppleness and elasticity is created in the first place by the exactitude of rhytme. It might sound strange or paradoxical, but the more precise the rhytme, the more supple, fragile and breakable will this theme sound. The second theme has something ritual in it., The constant closeness of the two themes will create the unavoiable clash at the end of the piece. Avi Schönfeld about the "Evocations"